For the Chicago Blackhawks, it's a familiar scenario. For the Minnesota Wild, it's territory unchartered for a significant period of time. The defending Stanley Cup champions are in the Stanley Cup Playoffs for the sixth straight season and have advanced past the first round for the fourth time in that span. They're 3-0 in the previous second-round series. Until a Game 7 win against the Colorado Avalanche on Wednesday, the Wild hadn't been out of the first round since 2003, when they came back from 3-1 deficits in consecutive series against the Avalanche and Vancouver Canucks to go all the way to the Western Conference Final, where they were dispatched by the Anaheim Mighty Ducks. Game 1 of this Western Conference Second Round series takes place Friday at United Center (9:30 p.m. ET; NBCSN, TSN, RDS). The Blackhawks made short work of the Wild last spring, winning their Western Conference Quarterfinal series in five games. But the Wild exacted a bit of revenge this season, winning three of five and earning seven of a possible 10 points. They were 2-1-0 in St. Paul and 1-0-1 in Chicago, losing 3-2 in a shootout on April 3 in the last of the five-game season series. The 2013-14 Blackhawks had their share of ups and downs before finishing third in the Central Division and spotting the St. Louis Blues a two-game lead in their first-round series. However, the Blackhawks looked every bit like a team that could repeat as Stanley Cup champs when they steamrolled the Blues in winning four straight games. That was especially true in Game 6, when they blew open a 1-1 tie with four third-period goals for a 5-1 series-clinching victory on Sunday afternoon. The Wild spent all of their first-round series playing catchup against the Avalanche -- and it finally paid off. Minnesota overcame 2-0 and 3-2 series deficits to force Game 7, then wiped out four one-goal deficits in the deciding game before Nino Niederreiter's overtime goal gave the Wild a 5-4 win. Forward Zach Parise led the Wild and tied for the League lead in the opening round with 10 points (three goals); center Mikko Koivu was next with six. Chicago captain Jonathan Toews tied for the team lead with seven points and made his three goals count; each was a game-winner, and his overtime goal in Game 5 was a backbreaker. Norris Trophy finalist Duncan Keith, who matched Toews with seven points, led Chicago with an average of 29:51 in ice time per game. That's four seconds more per game than Minnesota's Ryan Suter, whose 29:24 average during the regular season was 2:20 more than runner-up Erik Karlsson of the Ottawa Senators. Keith makes the Chicago offense go; he led all NHL defensemen during the regular season with 55 assists. He will also have his regular partner, Brent Seabrook, available for the whole series; Seabrook missed Games 3-5 against the Blues after he was suspended by the NHL for an illegal hit on St. Louis captain David Backes in Game 2. Jonathan Toews and Patrick Kane looked healthy and refreshed in the first round. Toews, who missed the last six regular season games with an upper-body injury, finished the series tied with Duncan Keith with a team-high seven points. He scored three game-winning goals, including the overtime winner in Game 5. Kane, who missed the final 12 games of the season with a knee injury, had three goals, including the overtime winner in Game 4, and six points despite playing with a knee brace on for the first time in his career. Bryan Bickell picked up where he left off in the playoffs last year with another big series. He scored two goals, had an assist and helped the Blackhawks match the Blues' physicality. Bickell started the series on the third line, but finished it on the first line. Marian Hossa and Patrick Sharp had several quality scoring chances throughout the series and were first and second, respectively, in shots on goal on the team (29 for Hossa, 23 for Sharp). They managed just one goal each, but were timely goals. Hossa gave Chicago a 1-0 lead in Game 5. Sharp scored what might have been the knockout blow goal in Game 6. His breakaway goal gave Chicago a 3-1 lead early in the third period. Brandon Saad hounded the puck and had four assists. Ben Smith moved up from fourth-line right wing to second-line center and added a speed dimension between Sharp and Kane that previously did not exist when Michal Handzus was there. Handzus was a factor on the penalty kill. He led Chicago's forwards with 14 blocked shots. The Minnesota Wild showed great depth and firepower from their forwards in the first-round victory against the Colorado Avalanche. In the seven-game series, Minnesota had seven different forwards reach at least five points, led by Zach Parise’s 10. Nino Niederreiter, the Game 7 hero, had four points. Ten different forwards potted at least one goal. While the team still prides itself on its defensive acumen, these Wild know how to score goals. Game 7 was a perfect example. Four times they fell behind, four times they found an answer before winning in OT. Parise leads the group and could stake a valid argument to being the most dynamic forward in a series loaded with players fitting that description, including Jonathan Toews and Patrick Kane of the Chicago Blackhawks. He led the Wild with 10 points and was dangerous from the low slot throughout the series. Mikko Koivu earned the most ice time in the series, playing an average of 21:20 per game, and responded with five assists and six points. Charlie Coyle found his game late in the season and used his combination of size and skill to continually test the Avalanche defense. Dany Heatley, scratched for the first two games of the series, was a revelation in the final five games. In Game 7, he was among his team’s most dangerous forwards, finishing with a point-per-game average in the series. Matt Moulson, expected to be among the offensive leaders after being imported at the NHL Trade Deadline, struggled with a goal and an assist in the first round. Suspended forward Matt Cooke is eligible to return during this series. Keith looked like the Norris Trophy finalist that he is in the first round. He had seven points, including four in Game 6, and played a major role on Chicago's penalty kill, which went 27-for-29. Keith played a shade under 180 minutes in the series, averaging near 30 minutes per game. He appeared to elevate his game when his normal defense partner, Brent Seabrook, was out of the lineup serving his three-game suspension. Seabrook returned in Game 6 and didn't look like he missed any time. He had two assists in more than 22 minutes in the series-clinching win. He finished the series with six points in only three games. Sheldon Brookbank played well in place of Seabrook in Games 3, 4 and 5. Niklas Hjalmarsson's minus-5 rating would suggest he had a tough series, but that's the flaw of the plus-minus stat. Hjalmarsson was caught on the ice for some of the Blues' best chances, but he was still one of Chicago's most effective defensemen and arguably their best penalty killer. He led the Blackhawks with 26 blocked shots, the most in the NHL at the time that Chicago finished the series. Johnny Oduya had a solid series, though Quenneville would like to see him contribute more offensively. Michal Rozsival had a sneaky good series as no one was really talking about him, but he still had three points, a plus-4 rating and played more than 18 minutes per game. Nick Leddy moved the puck well against the Blues and occasionally jumped into the play. He looked confident and played 15:44 per game. Minnesota's six-man unit on the blue line isn't going to provide a ton of offense (12 points in the first round), but it will defend stoutly. Ryan Suter is the linchpin of the unit and only Alex Pietrangelo of the eliminated St. Louis Blues and Duncan Keith of the Blackhawks played more per game than Suter's 29:47. He has proven to be the game-breaking talent expected when he was pried from the Nashville Predators as a free agent. He will see a ton of Toews and Kane this series. Fortunately, Suter has a good supporting cast. The five remaining defensemen each managed a plus rating in the first round. Jared Spurgeon and Jonas Brodin are coming into their own rapidly. Each played more than 24 minutes per game in the first round. Spurgeon had a huge goal in Game 7, forcing overtime by pinching in and delaying his shot momentarily to beat Semyon Varlamov. Marco Scandella is the final member of the big four, which sees the majority of the ice time. Coach Mike Yeo tends to spot third-pair defenders Clayton Stoner and Nate Prosser. That, however, could cause some matchup problems against the Blackhawks, an especially deep team up front which is not afraid to jumble its lines. Corey Crawford challenged himself to be better after giving up four goals, including the overtime winner, in Game 2 against the Blues. He answered by posting a .954 save percentage and 1.38 goals-against average in the next four games, all wins. Crawford arguably stole Game 3 with a 34-save shutout performance in a 2-0 win. He gave up three goals in Game 4, but the Blackhawks won in overtime. He was again superior to Blues goalie Ryan Miller in Games 5 and 6, when he combined to allow three goals on 65 shots. The Blackhawks would not have survived in the series without Crawford occasionally making the impossible save look possible. He robbed T.J. Oshie with a diving paddle save in Game 5 that it appeared he had no business making. In Game 6, Crawford reached back with his arm to swipe a loose puck off the goal line. Had he not gotten the back of his catching glove on the puck, the Blues would have taken a 2-1 lead early in the second period. Instead, the game stayed tied until the third, when Chicago turned it on with four goals. Antti Raanta is Crawford's backup. He didn't appear against the Blues. He was 13-5-4 with a .897 save percentage and 2.71 GAA in 25 regular-season appearances. This is a minefield for the Wild entering the second round, but fortunately Yeo has practice at navigating it. The Wild used five goalies in the regular season, and both Ilya Bryzgalov and Darcy Kuemper saw extensive time during the first round. Bryzgalov started the series, but was strafed during back-to-back losses to open the playoffs. He was then replaced by Kuemper, who ran off three wins in four games to catapult the Wild back into it. Kuemper started Game 7, but was injured and replaced by Brzgalov in the third period with the Wild trailing by a goal. Minnesota tied it and Bryzgalov had to make just one save between that goal and Niederreiter’s winner to earn the victory. The Wild have yet to update Kuemper’s status and it is unclear if he will be ready to go for Game 1. "All I can do is just practice," Bryzgalov said. "I can't predict the future." Joel Quenneville made subtle moves with his top-six group of forwards that worked in the final four games against St. Louis. Late in Game 4, Quenneville swapped Handzus for Smith, putting the speedier and younger Smith in between Sharp and Hossa. The move gave Chicago more speed on its second line, and freed up Handzus to become a penalty-kill specialist for Chicago. Also in Game 4, Quenneville put Bickell, Toews and Hossa together as a line. Their physicality appeared to overwhelm the Blues, as the Blackhawks kept the puck in the zone and Bickell scored the game-tying goal late in regulation. Quenneville also bumped Marcus Kruger up to the third line with Andrew Shaw and Brandon Saad. That line kept Chicago's speed game intact. It's no surprise that Quenneville's moves worked out. His moves have been working out for a long time. He is third in all-time wins behind Scotty Bowman and Al Arbour. Yeo has done a splendid job with this team, coaxing it into the second round despite long odds. As mentioned, the team used five goalies during the regular season, but somehow it adapted and prospered. Their starting goalie was injured in Game 7, yet the Wild never blinked an eye. Heatley was benched for the first two games of this series, yet Yeo found a way to get him back into the lineup and, more importantly, have an impact while playing well at both ends of the ice. Coyle lost his way during the second half of the season, so Yeo had a casual chat and reminded him what the foundation of his game is. Coyle scored three goals against the Avalanche and was a matchup nightmare. Yeo is not afraid to mix things up and make adjustments during the game. He has been forced to all season, as the club has battled several hardships. It will be interesting to see how he game plans, especially on the blue line, to counter the advantage Chicago has with its loaded fleet of forwards. Chicago's penalty kill was arguably the biggest factor of the series against St. Louis. The Blackhawks were 27-for-29 on the PK, including 6-for-6 in Game 6 and 15-for-16 in their four wins. The only problem was the number of penalties (32 total). The Blackhawks know they have to cut down on that, but they didn't have to worry about it in the first round because their PK was exceptional. Chicago's power play was only 3-for-20 in the series, but it didn't have to be great because of the exceptional penalty kill. The Blackhawks still scored some timely goals on the power play, such as the Toews' goal early in the third period of Game 6. That was the game-winning goal. Shaw gave Chicago a 1-0 lead in Game 4 with a power-play goal. Seabrook scored a go-ahead goal on the power play in the first period of Game 1. Minnesota has a bit of a problem here. The Wild are not good on the power play, managing three goals on 21 attempts against Colorado. The 14.3 conversion rate is the second-lowest among the eight teams remaining in the playoffs. To make matters worse, the Chicago penalty kill is the best in the tournament. In the first round against a potent St. Louis team, the Blackhawks allowed two man-advantage goals in 29 power-play situations. It also doesn’t help that the Wild do not draw a ton of penalties, averaging three power-play opportunities per game. Minnesota was good on the penalty kill, allowing three goals in 25 opportunities during the first round. Chicago had a bit of trouble during the first round with the man advantage, so if the Wild can stay out of the penalty box they should be in decent shape here. Marian Hossa -- Hossa looks like a player primed for a breakout performance in the second round. He led Chicago with 29 shots on goal in the first round. He was a threat to score multiple times in every game. He was around the puck, hounding the puck, physical, fast and elusive, but he finished with only one goal. Hossa was better once Smith moved to center his line on a full-time basis. If Smith stays as the second-line center and Sharp continues to play well on the left side, Hossa could bust out and have a major impact on the second-round series. 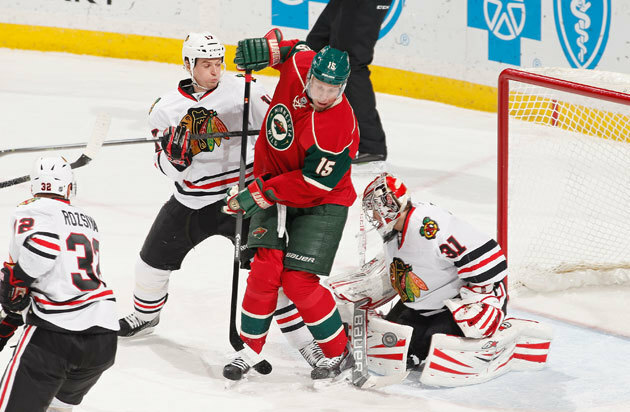 Dany Heatley -- The enigmatic forward could hold the key for the Wild. A first-round pick many moons ago, Heatley has the offensive flair to be a game-breaking talent. But the rest of his game has deteriorated to the point he was not in the lineup for the first two games of the first round. Upon re-entering the fray, though, Heatley played the 200-foot game Yeo demands from those that dress for him. If he plays the second round like he did Game 7 against Colorado, he changes the look of this team. Blackhawks will win if … Their stars continue to produce and they stay out of the penalty box. The Blackhawks lived on the edge in the first round with 29 minor penalties in six games. That's too many. Their penalty kill saved them in the first round, but it's a dangerous game to play when you take that many penalties. The defending champs are obviously experienced enough to know that. Wild will win if … Kuemper can make a quick recovery from whatever knocked him out of the third period of Game 7 on Wednesday night. 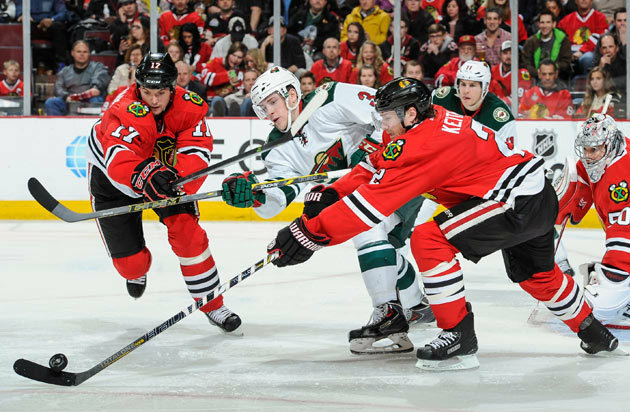 The Wild will need to be firing on all cylinders to compete with the higher-seeded Blackhawks, the defending champions, and Kuemper gives them the best chance to be at maximum efficiency. Bryzgalov was a season-saver when he arrived before the Trade Deadline, but he allowed eight goals in less than two games to start the first round.